The Norwegian Competition Authority cooperates with the competition authorities in the other Nordic countries. Since 1959, the Nordic competition authorities meet every year to exchange experience and discuss matters of common interest. In 2001, Denmark, Iceland and Norway signed an agreement that provide a better basis for enforcement and exchange of confidential information between the competition authorities . Sweden joined the agreement in 2004. The parties signed a new agreement in Helsinki September 8th 2017. The renewed agreement implies that the authorities may gather information and carry out dawn raids on their own territory on behalf of each other. The new agreement also expands the Nordic cooperation geographically. Finland will become a party to the cooperation agreement, in addition to Denmark, Iceland, Norway and Sweden. A strengthened and expanded Nordic cooperation on competition policies will lead to a more efficient enforcement of Competition Law. The agreement will expectedly enter into force during the first part of 2019. 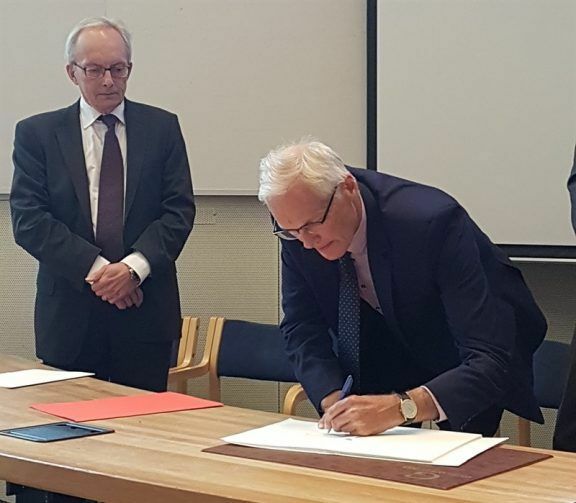 Director General Lars Sørgard signs the Nordic cooperation agreement.